Developmentally appropriate activities are grounded in research and are designed to meet the child's needs as an individual learner. In the grade-school classroom this includes a curriculum that balances information, interest and involvement. Lessons and activities are both age-appropriate and individually appropriate for the child's developmental stage and learning style. In the grade-school years developmentally appropriate activities combine a mix of traditional teacher-led instruction with hands-on opportunities that help the students to build on what they already know. School-age children are becoming reflective and purposeful thinkers. They can benefit from exploring on their own, but still need direct instruction when it comes to the introduction of new material. For example, you instruct the students in math, providing them with information how to add and subtract two-digit numbers. After giving them the knowledge that they need, the students can then explore the math concepts by creating their own story problems, solving the equations and using manipulatives -- such as beads on an abacus -- to better understand the ideas. Physical education is a key part of the grade school curriculum. Activities in this discipline that are developmentally appropriate include those that also promote cognitive development, are culturally sensitive and allow children to build confidence in their abilities to move and play games. These may include group games such as soccer, basketball or kickball as well as rhythmic activities such as dancing with ribbons and streamers. Even though competition is part of many sports practices, developmentally appropriate activities encourage participation, fair play and competing on a level that meets the child's abilities. For example, students can learn about teamwork while building gross motor skills by passing a soccer ball back and forth. Creating a free-choice time in any given subject is one way to facilitate classroom activities in a developmentally appropriate way, suggests teacher Jim Pelander on the National Association of Independent Schools' website. In this type of activity you should instruct the students to select or create an activity that connects to something that they have learned in class. For example, a more visual and artistic student may want to draw a picture of the frog's life cycle after observing the classroom frog. A more literate student may opt to explore these concepts by reading about the frog's transition from tadpole in the school's library and then writing a paragraph about what he learns. 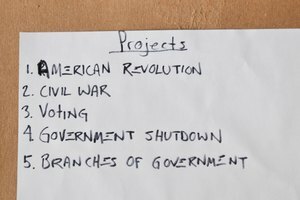 Instead of assigning the entire class the same project, you can allow the students the chance to pick a theme or subtopic to investigate on their own. For example, imagine you are studying ancient Greece with your students. Instead of telling everyone that they must write a book report on the goddess Athena, ask the individual students to pick what aspect of Greek culture they want to research. The students can then put together a comprehensive project based on how each one of them learns best. An artistic student may want to create models of Greek architecture that she labels with facts that she researches, while a more mathematical child may want to draw scale blueprints and write a report that focuses on the use geometry in ancient Greece. The projects can include multiple activities that combine to form one cohesive assignment. These may include art, writing, research and other content areas. Scholastic Teachers: Defining "Developmentally Appropriate"
What Are Multidisciplinary Lesson Plans? Loop, Erica. 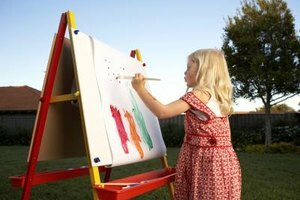 "Developmentally Appropriate Activities for School Age Children." Synonym, https://classroom.synonym.com/developmentally-appropriate-activities-school-age-8531810.html. Accessed 22 April 2019.